This stainless steel spatula quickly adjusts to three lengths to suit any grilling task at hand. Featuring stainless steel construction with a comfortable contoured hardwood handle, this spatula is designed for long lasting use. 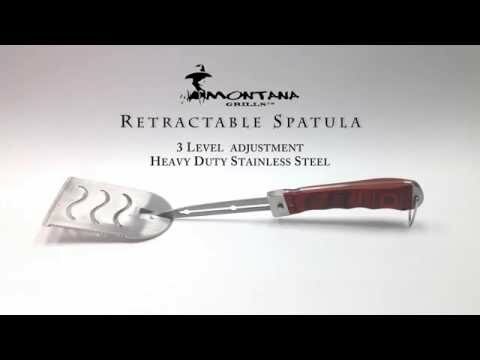 The wide design of the spatula makes it easy to support large cuts of beef, chicken or fish. The edges are serrated so you can get under the food more easily. The spatula is also dishwasher safe for easy cleaning. The spatula is 13 1/4 inches long on the shortest setting and 18 inches long on the highest. WARNING: The use of this product can expose you to chemicals including Carbon Monoxide, which are known to the state of California to cause cancer.